eCommerce industry in one of the most upcoming and developing industry in this fast-moving tech world. But, having one of the best eCommerce store is never easy as the technology and the mindset of buyers always changes. Choosing a perfect content management system (CMS) to make the online store complete is difficult and here comes one great giant to save. It is none other than Magento. What is Magento? It is an open-source content management system (CMS) used for developing eCommerce websites with advanced features. Magento is constantly improving its features to support the most advanced and useful variants of eCommerce. Recently, They released a beta version called Magento 2 that has incredible features that need to be looked after. It is an open source eCommerce R&D project that is used to improve the functionalities of the core products of Magento. Magento 2.0 is expected to outrace Magento 1 by 20%. What does the release of Magento 2.0 means? Don’t panic. It doesn’t mean that Magento is going to discontinued. The support will continue for the next three years i.e. till 2018. The release of new Magento means that there will be no new features addition to the old lad of the Magento family and the version 1 will go into maintenance. 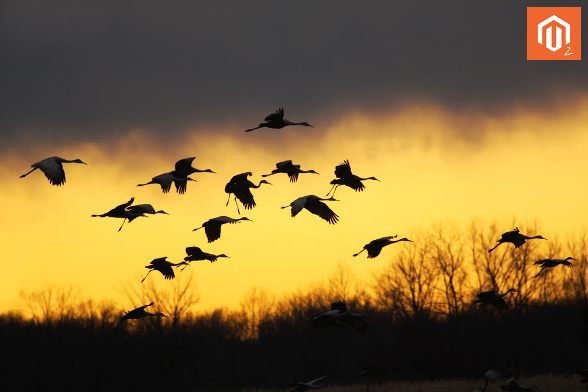 Is it easy to migrate? If you think it is as easy as eating an apple pie to migrate to Magento 2, then you are completely wrong. The task is not that easy to migrate, and also, it is not that difficult. Confused? Fear not! The process is complicated but not so difficult to do the migration. The power of Magento depends on its community and already the extension and plugins developers have started developing stuff for the new baby, Magento 2. Not only the community developers but also many eCommerce website development companies have started training their developers to learn the art of developing an extension for Magento 2. Why migration is a bit complicated? Migrating the core data like products, orders, customers, promotions, etc. is quite easy while the themes need to be restructured as the entire layout of Magento 2 is different from Magento 1. Even the extensions and plugins need to be updated to match the base of Magento 2 configuration. The Vice President (VP) of architecture at Magento Commerce, Alan Kent said, “Magento 2 is worth waiting for”. What are the changes in Magento 2 compared with Magento 1? Magento 2 is sure to be a stable shot as it is already promising good results. For many users, data migration is tedious, and troublesome process as Magento 2 has many new things in its package. Here are few changes in the Magento 2 beta’s structure when compared with that of Magento 1. How to migrate to Magento 2? As said earlier, Magento 2 migration is little tedious and will take a huge time to implement complement. Stay tuned to our blogs to learn more about migration. We will hit another post shortly with the steps to follow to migrate your website from Magento 1 to Magento 2.